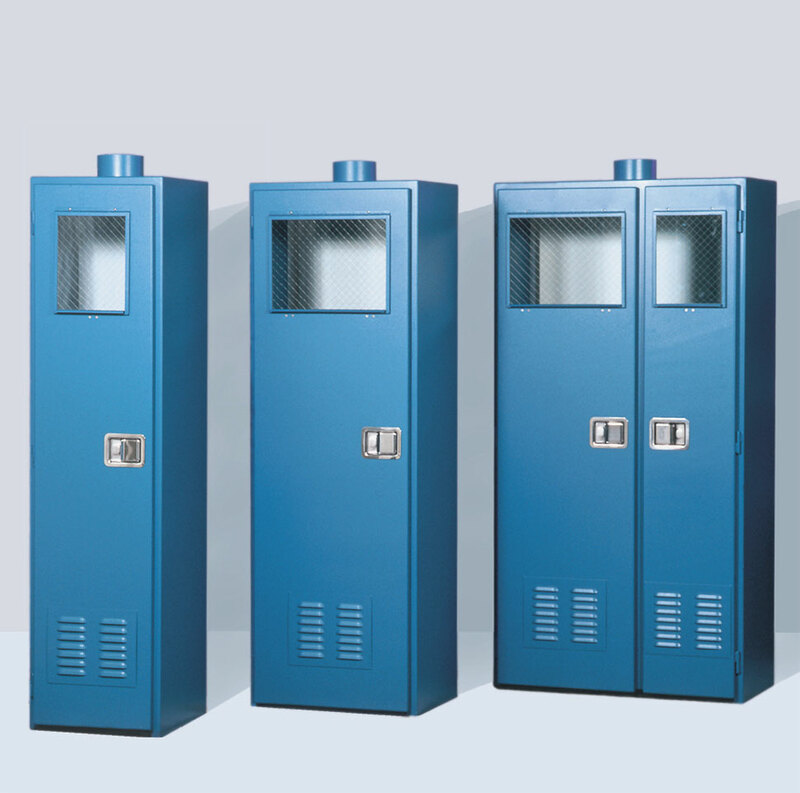 Gas safety storage cabinets are designed to provide local exhaust gas control to enhance the safety of storing or using hazardous gases. The use of gas cabinets provides a convenient way to achieve separation of gases by their classifications to satisfy both national and local fire and building codes. When connected to a suitable exhaust system, air is drawn though the cabinet ensuring that any gas leakage is carried away and does not accumulate in the storage or work area. The cabinets can be fitted with manifolds or other gas controls so that both the cylinder and the control system are enclosed. When operators access the controls through the access window and a proper exhaust system is in operation, the cabinet has the capacity to allow 150-200 linear feet per minute of air to pass across the open window face to ensure that workers are not exposed. All welded construction using 11 gauge steel, epoxy painted. Texture finish outside, smooth finish on inside of cabinet. Exhaust vent located on top of cabinet is 6" diameter x 3" high. 165° F. sprinkler head with bee's wax coating located in cabinet top. Cylinder brackets accommodate 7"-9" diameter cylinders. The brackets can move vertically and horizontally for precise pigtail alignment. Self-latching and closing window(s) with 1/4" thick wire glass. Self-latching and closing door(s) with bottom louvers and flush mounted stainless steel paddle latch(es). Optional keyed latches available. Meets or exceeds the Uniform Fire Code. *Overall cabinet height including exhaust vent is 75".